Have you gotten your hands on the new Galaxy Note 7? 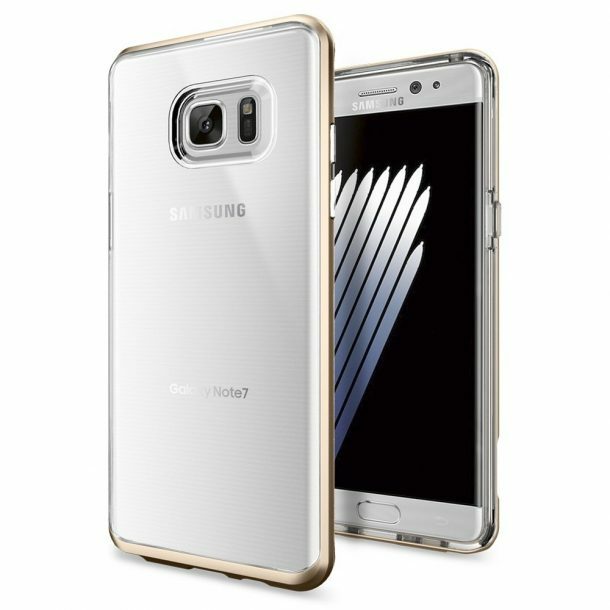 If you are thinking of getting one, take a look at these cases to protect and compliment your Samsung Galaxy Note 7. This is a crystal hybrid case with a metal kickstand by Spigen. The metal kickstand uses a magnetic clip for easy use. This re-designed case has been reinforced to resist big impacts and the dual layer protection increases your phone’s life. It has a slim and non-bulky profile with raised lip protection to protect the camera from contact surfaces. This case has been tested for Military Grade 810-G drop test and features shock absorbing and impact dispersion technology. It has been genuinely designed with care for aesthetics and comes with a tempered glass screen protector. This case protects your phone’s back from dust, filth and scratches. 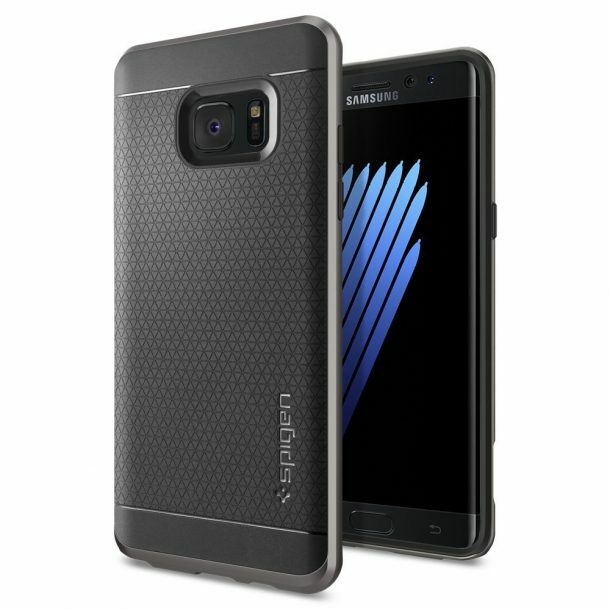 This is Galaxy Note 7’s case designed by Spigen. The unit comes with card holder in the phone case and features dual layer and air cushion technology. 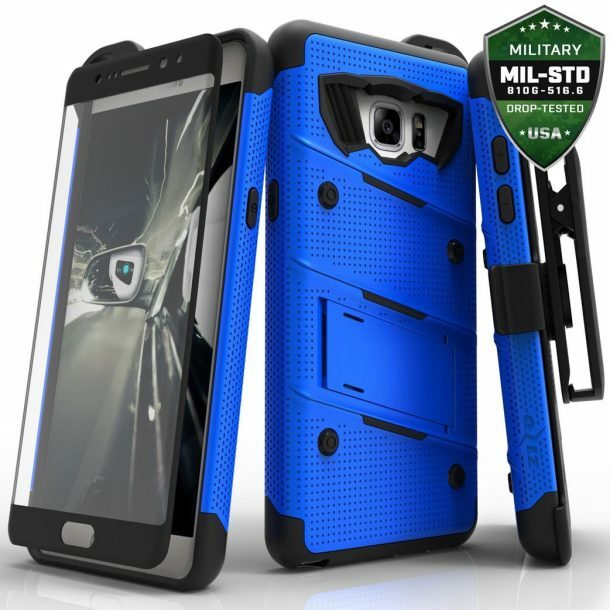 It has been tested for military grade drop and is slim fit to your phone. It protects your phone well from dust you can slide up to 2 cards in the compartment. A great buy. 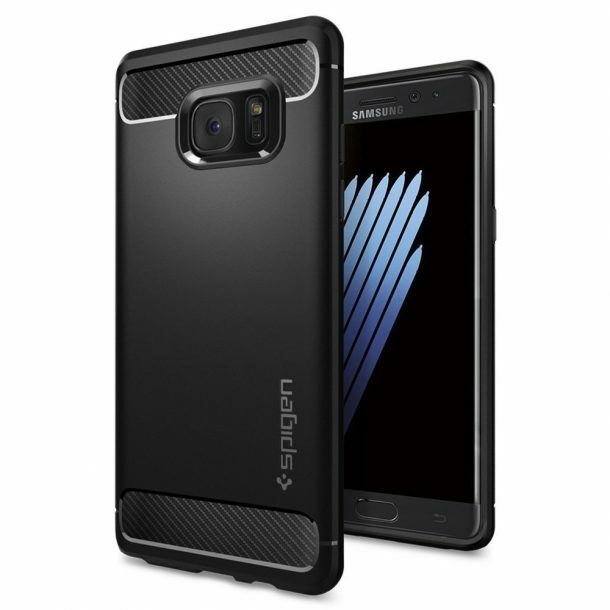 This is Samsung Galaxy Note 7 Neo Hybrid case by Spigen. 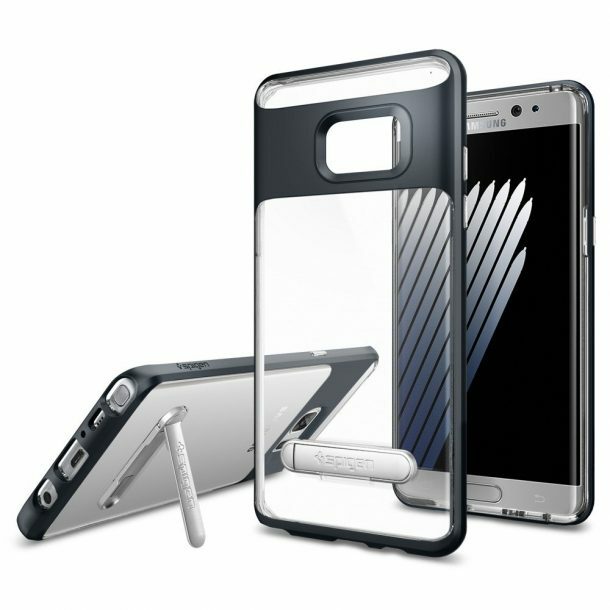 The case has been re-designed for protection against big to mild shocks and drops. The unit features dual layer polycarbonate frame with raised lip protection for the camera lens. It has sizeable and precise cutouts for the audio jack, camera, etc. and is made up of premium material. “The fitment of the TPU case and polycarbonate frame fit perfectly together, the fitment of the two are precise. The soft back of the TPU case feels great in hand. There finish is matte and so fingerprints are less likely. The case is not too thick nor too thin, it should provide solid protection from everyday drops. 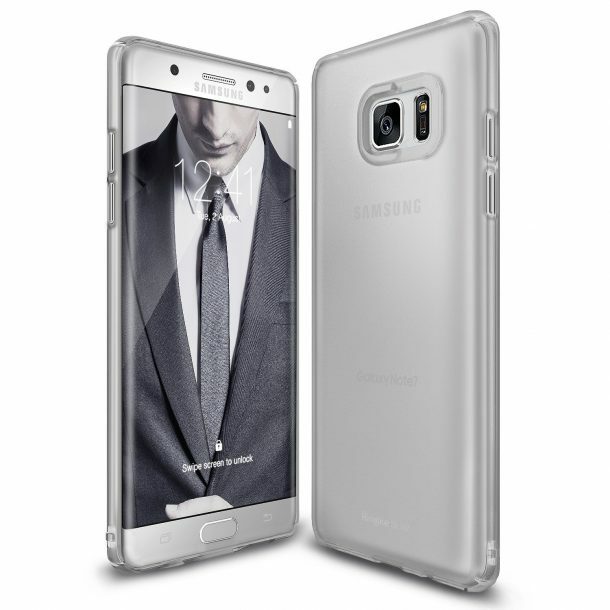 This is definitely a sleek and elegant case for the Note 7!“- Amazon’s Customer Review. 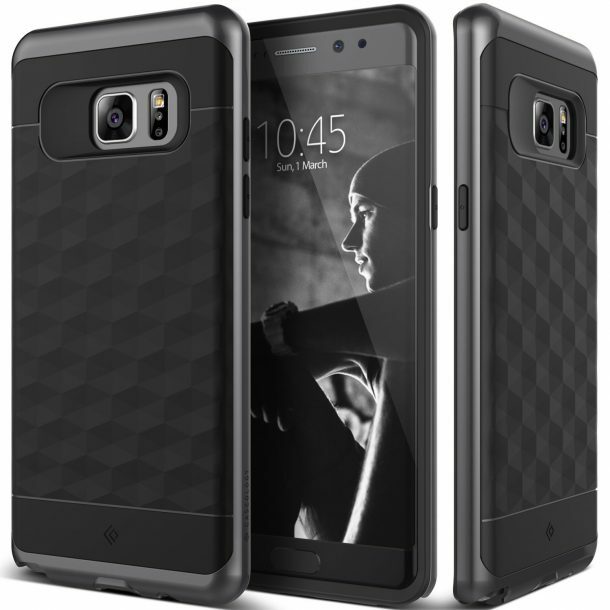 This is a rugged case by Spigen for Samsung Galaxy Note 7. The case is made up of premium single layer TPU which is flexible and durable. The unit feels smooth and comfortable in your hand and has covered button for a great experience. It comes with a carbon fibre texture and glossy accent which looks pretty slick and is nicely built. “Well don’t have the phone yet obviously but figured I’d pick up a case so I have one for when I do get my phone. Overall feels like a solid case. Flexible but semi-rigid at the same time. Very nice feel, not slippery at all. And the case is a touch bigger than my s7 edge. Slightly wider where my s7 edge wasn’t snug, and a bit taller. Corners aren’t as round as the s7 edge. Can’t wait to get my phone now! Lol”- Amazon’s Customer Review. This is a slim and stylish snug fit for your Note 7 by Ringke. The case comes with semi-transparent floss colour to add a smooth and soft feeling. The thin and lightweight design keeps the original look of the smartphone and has precise slots for power, volume and audio jack. It covers all the edges of the smartphone and has tapered lip and lifted camera bezel to keep the phone off the surface for screen safety. The edges come smooth and are comfortable to hold. 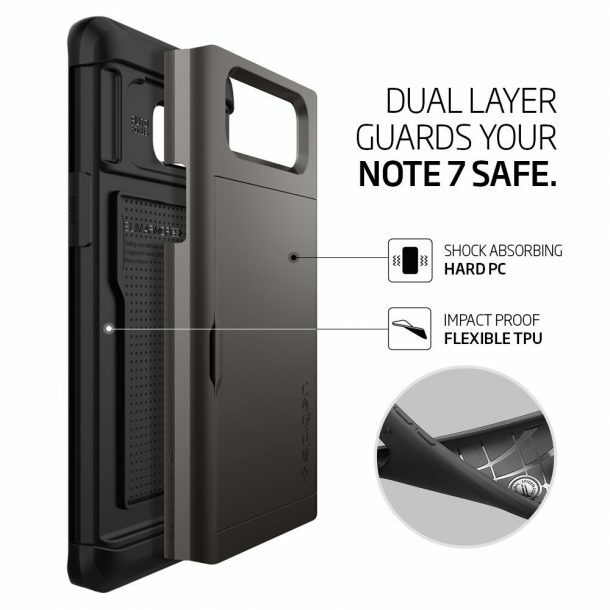 “This is an exceptional case, as it covers all the bases when it comes to choosing a case with the intention of being able to provide ample protection to ones phone, make sure all the ports are open and accurately cutout, and allow you to use screen protectors without fear of them being peeled off whilst removing the case for whatever reason. 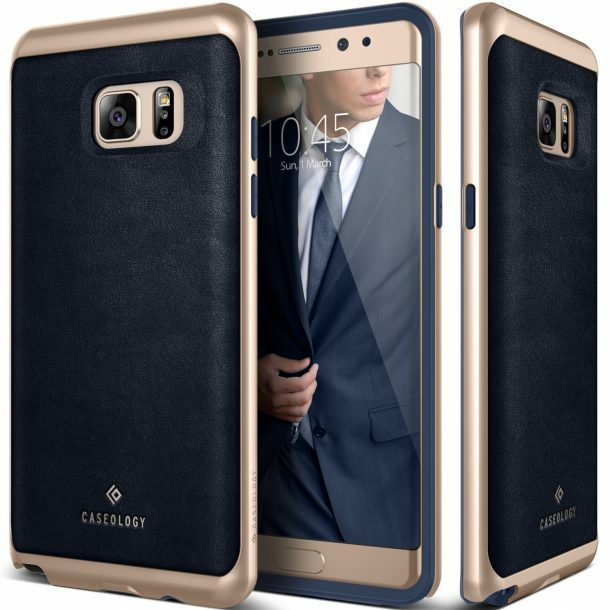 I recommend this case for those looking for a great case with an excellent design for their Galaxy Note 7.”- Amazon’s Customer Review. 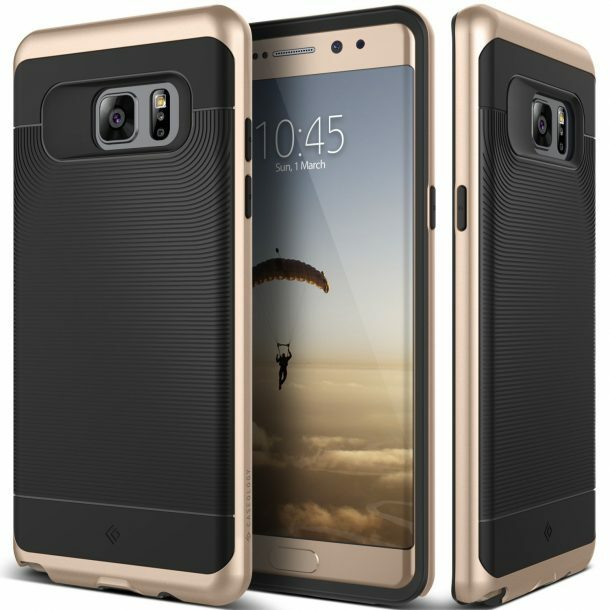 This Galaxy Note 7 case by Spigen is a dual layered military drop tested case which protects the phone from big and mild impacts. The recontoured frame and non-slip TPU allow for enhanced handleability and the clear TPU maintains the original look of the Galaxy Note 7. The raised lip protection keeps your camera safe and clean. The unit has sizeable cutouts for cables and the Note 7 pen. “Looks Good and awesome. Would recommend this case if you’re trying to keep your Samsung Galaxy Note 7 safe From Drops and Scratches”- Amazon’s Customer Review. This case by Caseology comes with a classic appeal of the premium PU leather. The unit has soft operating bumper which is comfortable to hold and contains a TPU sleeve wrapped in artificial leather and durable polycarbonate bumper to keep your phone safe. It comes in 5 classic colours and is not bulky at all. “The case design is sturdy with the ridges would make the case easy to hold when this phone releases. It is not too bulky or thin. I have this case for my S7 Edge and it has been a lifesaver. Because this case this sturdy it does not crack, bend, or split when dropped. This makes the protection factor great!”- Amazon’s Customer Review. Caselogy’s textured pattern grip case comes with a three-dimensional pattern to provide the user with a secure and comfortable grip. The unit comes with a TPU sleeve and polycarbonate bumper to keep your phone safe from moderate to big impacts, shocks and drops. The case keeps your phone clean from dust, filth and scratches and comes in 5 different colours. “Loving my new case! The colour is a nice navy blue. And this is a soft/rubber case which I prefer versus the hardcover. This is very lightweight too! I would say lightweight because some cover can make your phone heavier. It protects all sides of the Galaxy Note 7 phone. The texture or ribbed body of the cover is a smart design to avoid slipping the phone from your hand while holding it. Overall, the cover adds beauty to the phone and protects it at the same time without making the galaxy note seven bulky and cumbersome. I totally love this cover and recommending it!”- Amazon’s Customer Review. This Galaxy Note 7 case by Caseology has a trendy and dynamic geometry pattern. The three-dimensional moulding and soft coatings create a secure and comfortable grip. The unit comes with reliable protection by the flexible TPU sleeve and structured polycarbonate bumper. The case is thin and stylish and is extremely well-built. “Wow. I have to say this case is extremely well built. The case itself is lightweight in spite of being so sturdy! I know with previous heavy duty cases, I have disliked them because of the weight. This WILL bulk the phone up but with this type of case, it is to be expected. The belt clip is simple to use, yet it is strong. It holds to the belt well and when the phone clips into the holster, it holds on tight. I recommend this phone to anyone looking to protect their phone and want a great value!”- Amazon’s Customer Review. Which case did you like best? We would appreciate your valuable feedback in the comment section below.